Retired Executive Vice President and Head of Global Employee Benefits business, MetLife, Inc.
Ms. Morris is the retired executive vice president and head of the Global Employee Benefits business of MetLife, Inc., a global provider of life insurance, annuities, employee benefits and asset management services. She served as executive vice president and head of the Global Employee Benefits business from 2011 and former interim head of the U.S. Business from 2016 until July 2017, with responsibility for MetLife’s U.S. business and employee benefits business in more than 40 countries, including its relationships with multinational companies and distribution relationships with financial institutions. 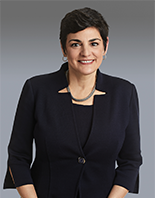 Ms. Morris served in multiple other leadership roles after joining MetLife in 1984, including as interim chief marketing officer from April 2014 to January 2015 and as head of Global Technology and Operations from 2008 until 2011 where she oversaw the successful integration of MetLife’s $16.4 billion acquisition of American Life Insurance Company. She is a member of the board of directors of S&P Global Inc., where she is Chair of the audit committee. Ms. Morris earned her Bachelor of Arts degree from Franklin and Marshall College. She is a member of the board of trustees of Catholic Charities Archdiocese of New York and Chair of the board of directors of All Stars Project, Inc.